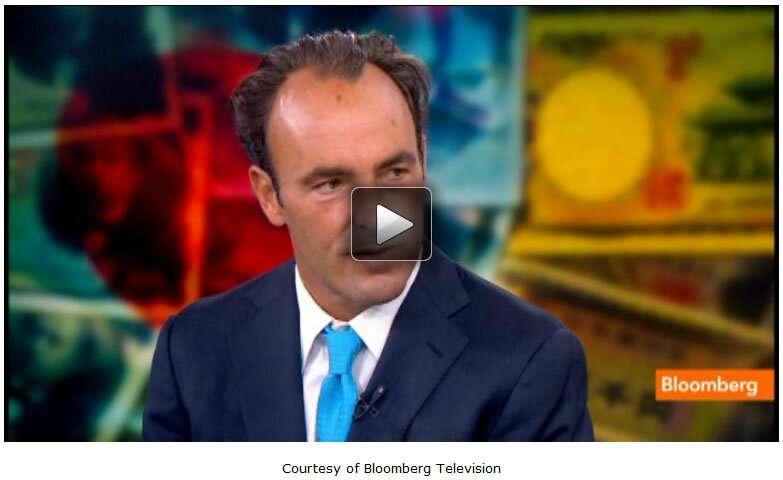 Kyle Bass, managing partner at Hayman Capital Management, told Bloomberg TV's Stephanie Ruhle and Erik Schaztker on "Market Makers" today that he thinks "it's the beginning of the end" for Japanese bonds. He said, "When I started sharing our views more globally it was the middle of 2010 and I said I believe the stress would begin to show itself in the next three years. Pretty much three years in, we're close, and the stress is beginning to show." "I actually think it's the beginning of the end...When you have 20 years of pro-cyclicality of thought manifesting itself in the way that it has in Japan...I am not naive enough to think I can predict the end of a 70-year debt super cycle with any kind of precision, but looking at the changes in the qualitative perception of the participants is something that I think is key to the situation and we saw a big change on Friday." "When I started sharing our views more globally it was the middle of 2010 and I said I believe the stress would begin to show itself in the next three years. Pretty much three years in, we're close, and the stress is beginning to show. Maybe that was luck at the time, but now when you ask the timing--look everyone wants the crystal ball and it's really difficult to predict this, but what you can do is follow where I think the stresses are going to show in the marketplace, but more importantly, you have to get into the heads of the participants because they all have a collective sense of fatalism. When you do the quantitative analysis here, you know they are insolvent. Everyone who owns the bonds knows they are insolvent. It's a question of how long they can hang on. What changes their views are a multitude of variables, but it's really important to follow any change in those views. When you see things like Argentina, Greece, Cyprus, Ireland, Italy--you see how fast things go from perfectly stable to completely unstable. In this case I think it will happen more quickly because of the 20 year buildup." "When we think about the globe, I think about positioning. When you invest in a fiduciary like myself or someone else, you want someone that has the courage of their convictions. You want someone that is not particularly dogmatic. And if they are, you want to think about risk management. It is really important to size things properly. So far, knock on wood, I think you have to be as thoughtful as you can possibly be on the construct of the position and not set yourself up for many years of losses until something like this happens." "It's really important to think about the capital at risk in your strategy and the construct of how you put these kinds of hedges into place. We have 90+% of our money is long--long U.S. structured credit, U.S. mortgages, U.S. stocks--they majority of our capital is long." "Believe it or not it's really liquid right now. With Bernanke pinning rates at zero and the entire world continues to chase yield. Our indices are being led by utilities and things that don't particularly lead us into new highs, it's because of their dividend yield. So the whole world continues to chase yield. Structured credit and even mortgage credit are one of the most liquid areas in the marketplace today. People can't get enough of them. Even in subprime credit, 97% of the 20,000 line items are still rated below investment grade. They're still junk. The ratings-based buyers aren't even there yet. The money is being misallocated by the printing press." "We have always had a position in gold. When you think about the largest central banks in the world, they have all moved to unlimited printing ideology. Monetary policy happens to be the only game in town. I am perplexed as to why gold is as low as it is. I don't have a great answer for you other then you should maintain a position." "George has been a much better investor than I over the years. When you think about the global monetary base, it is north of $70 trillion. All the gold in existence is around $7-8 trillion. There might be $1.2-1.3 trillion of investable gold. At some point in time, I would much rather would own gold than paper. I just don't know when that time is." "I do. If something happens in Japan like we think it is going to happen, I think U.S. Treasury nominal yields will go negative in a flight to quality. maybe gold moves up and Treasuries actually get much stronger for all the wrong reasons, not as an endorsement of U.S. fiscal policy because it is the only place money has to go...If monetary policy is the only game in town, we are all in for a world of trouble. That is the way we see it." "That investment is working...The various concentric circles surrounding housing not getting worse, which is how we think about it. We are not expecting it to get materially better, just not to get worse. The services sectors, the new mortgage insurance companies, the things that are actually asymmetric investments you can make around the housing market not worsening are where the majority of our long side of our portfolio is." "I have no clue...We decided to just exit, thinking about them when you meet with both sides of the aisle, they both want a bullet in their head. Typically when that happens you get a bullet in your head. The second thing we were thinking about, if you remember there was a proposal to start raising the g-fees. There is a way for the U.S. Treasury to get paid back all of the money they've pumped into Fannie and Freddie if they start raising g-fees."